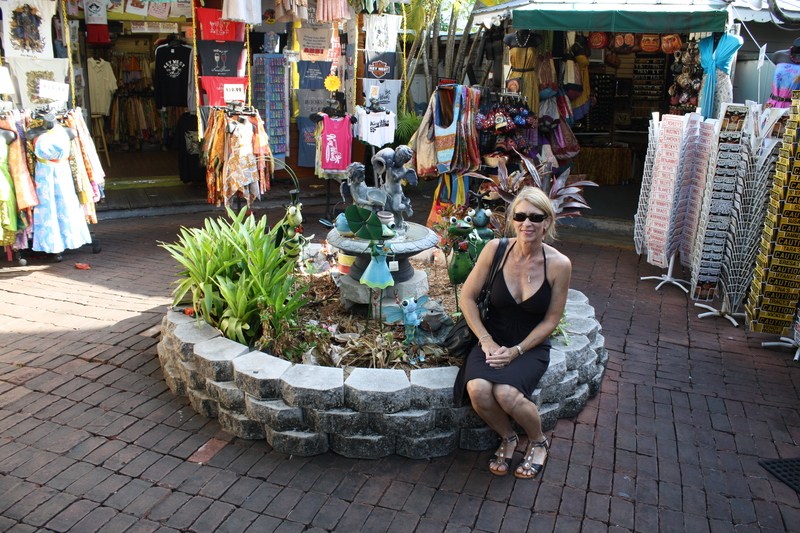 Duval Street is by far Key West’s most sought after address, dominating tourists destination agenda with a laundry list of things to do all on one main road. This pedestrian saturated street shares its narrow roads with vehicles, (which may soon change) for years they’ve considered making it pedestrian only since traffic is already at a near stand still during peak hours. Along this pavement paradise you can find dozens of bars, local restaurants, chain restaurants, T-shirts shops by the scores, ice cream parlors, coffee shops and many upon many specialty stores… but the #1 consumer of space along this stretch of adventure avenue is SOUVENIR SHOPS, SOUVENIR STORES & ALLEYWAY SOUVENIR VENDORS as seen above. There’s a number of alleyways chalk full of vendors selling everything under the sun to milk that last dollar from unsuspecting tourists wanting to return home with a couple of give-a-way trinkets. This vendor Valhalla is no exception, though it is visually different and by far the best, it’s arranged with a very nice brick bordered fountain & garden down at its end instead of cramming in that last vendor push cart selling key chains as others do. This is open and spacious compared to the elbow room only cramped hallways that teams of other vendors use to peddle their wares. 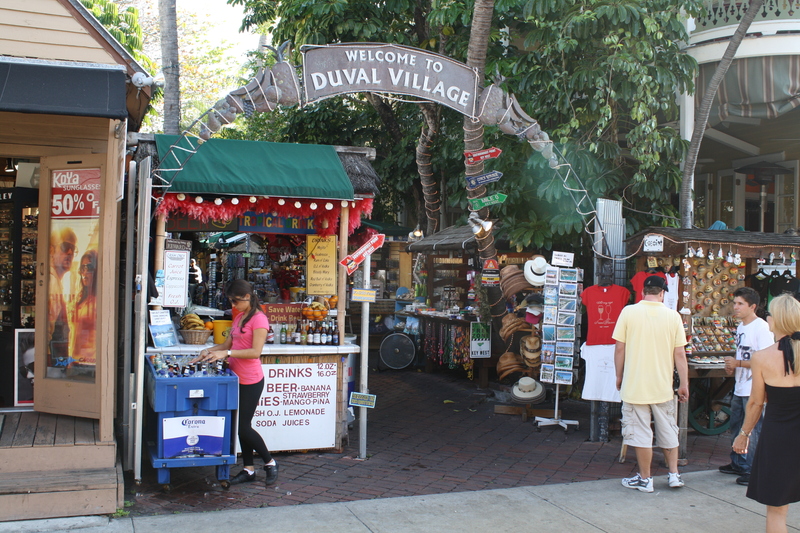 You can find this outdoor alleyway shopping wonderland called “Duval Village” on the northern end of Duval Street across from the Wachovia building that is NOT a Wachovia Bank! I ask you, where in the world can you find an authentic “Engine Order Telegraph” (E.O.T) also known as a “Bridge Telegraph” just sitting on a front porch for all to see and touch this antique? In Key West of course! Everyone has seen them in hundreds of old war movies shown on TV and even in the more recent movie flop of “Speed 2” without Keanu Reeves. A system of bells & ringers chime out as the handle of the E.O.T. goes from one to the other positions on the dial signaling that the ships speed has been changed. In short, the Engine Order Telegraph sends commands to the engine telling it what to do… you know, kind of like modern-day spouses! 🙂 hehe, not mine of course… I’ll shut up before I get into more trouble! Even though we’ve ALL seen them in movies, I’d wager to say that less than 2% of us have ever seen a real one! Well here’s your chance my friend, I found this yesterday while tracking down a statue of a pirate that I’ll use in a futur blog. The telegraph setting on this one from Liverpool/London England are as follows: Full Ahead, Half Ahead, Slow Ahead, Dead Slow Ahead, Stand By, Stop, Finished With Engines, Dead Slow Astern, Slow Astern, Half Astern, Full Astern. 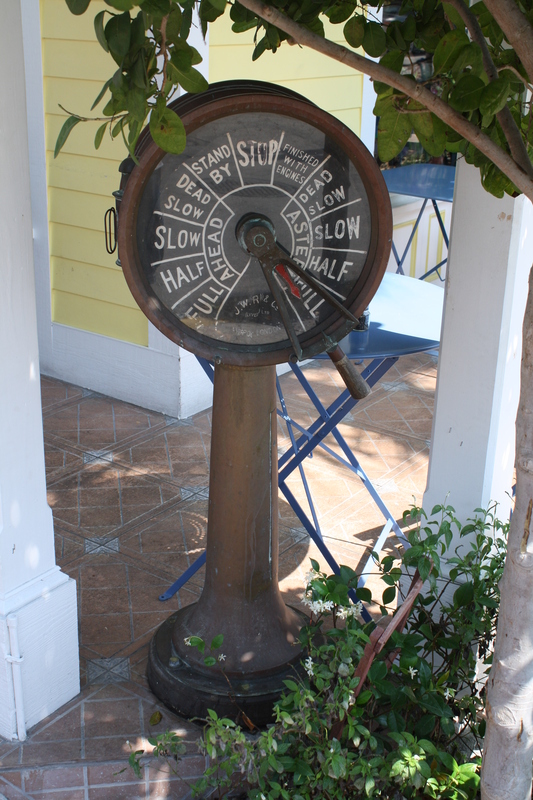 You can find this maritime artifact for all to see at the corner of Thomas Street & Petronia Street across from the Blue Heaven Restaurant in sunny Key West. In 1823 Key West was the home port of the West Indian Piracy Squadron. In short, a group of ships commissioned to curtail piracy in the West Indies / Caribbean Sea. 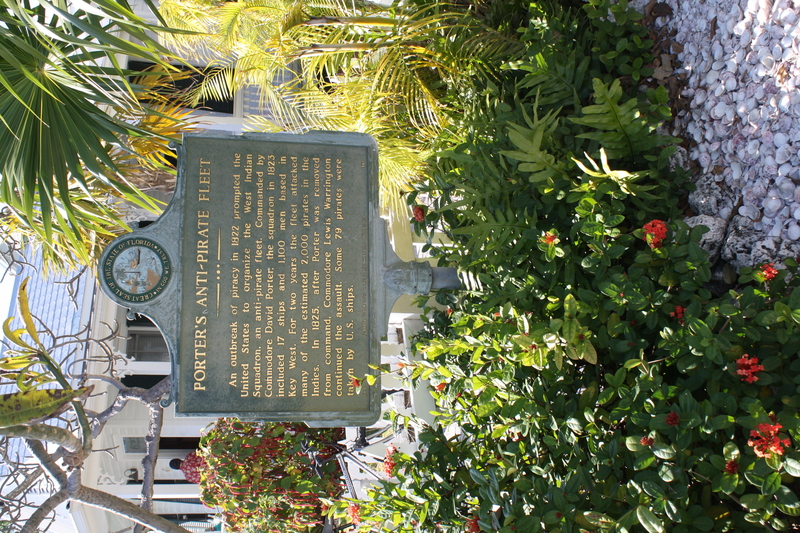 A historical marker on site says it best and reads as follows: PORTER’S ANTI-PIRATE FLEET – “An outbreak of piracy in 1822 prompted the United States to organize the West Indian Squadron, an anti-pirate fleet. Commanded by Commodore David Porter, the Squadron in 1823 included 17 ships and 1,100 men based in Key West. For two years the fleet attacked many of the estimated 2,000 pirates in the Indies. In 1825, after Porter was removed from command, Commodore Lewis Warrington continued the assault. Altogether 79 pirates were taken by U.S. ships.” The Naval Station in which he created was also active through two World Wars and the Cuban Missile Crisis from April 3, 1823- March 31, 1974. Although its function has varied over the years it has operated through seven conflicts with its staff reaching from a low of 17 military personnel in 1932 to over 15,000 military and 3000 civilians in 1945 during World War II. The year before his base in Key West was formed, in 1822 -“Mosquito Fleet” Commodore David Porter begins cruising Caribbean waters and the Gulf of Mexico in search of pirates. Early on in April 1823, Commodore David Porter defeats Cuban pirate known as Diabolito. Stop by and see this historic sign and relive the swashbuckling days of Black Beard and other pirates that cruised the West Indies / Caribbean Sea as their home. 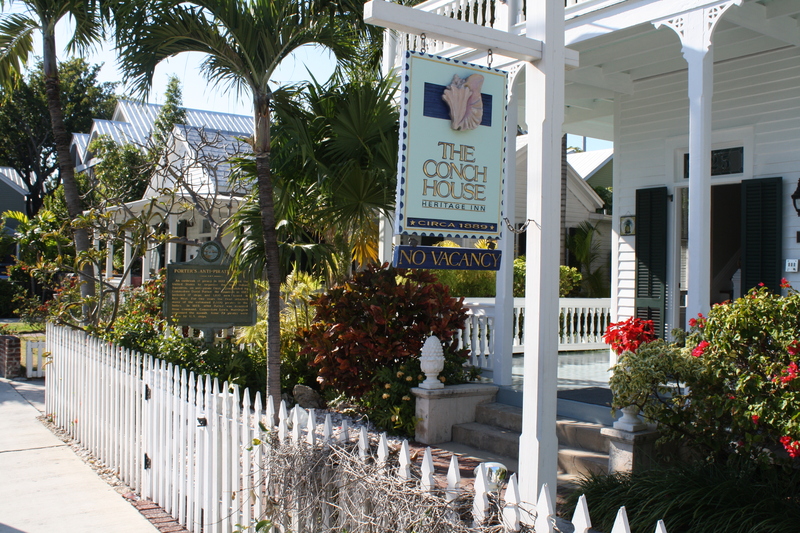 You can find this maker in front on the Conch House Heritage Inn at 625 Truman Avenue in Key West. 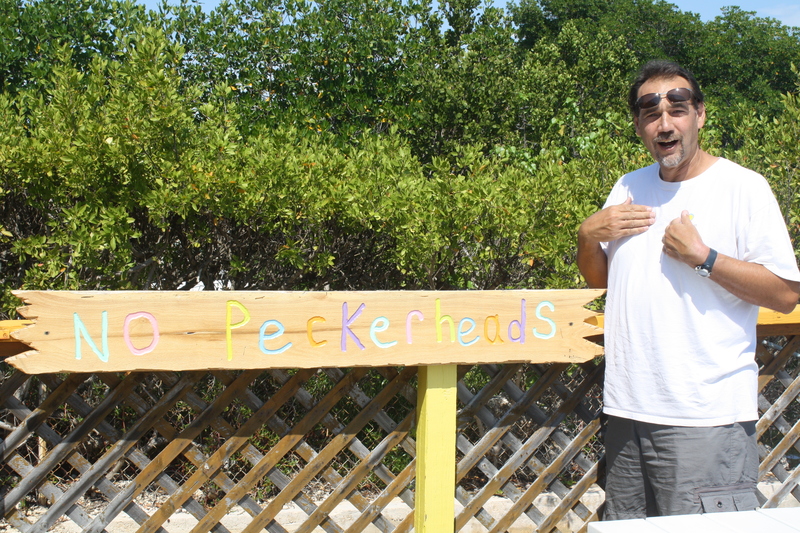 You can find this unique ‘No Peckerheads’ sign at the Turtle Club behind Snapper’s Key Largo restaurant at Mile Marker 94.8 oceanside. Turn onto Ocean View boulevard about 1/4 mile to Seaside Avenue where you’ll see it directly in front of you. Parking is FREE and so are the astounding views! KOA = Killer Offshore Attractions 🙂 OK, I made that up, it really stands for Kampgrounds Of America! But here, the ‘A’ is for attraction and the attractions are the VIEWS! Have a camper or RV? Here’s a GREAT place with plenty to do and even more to see! 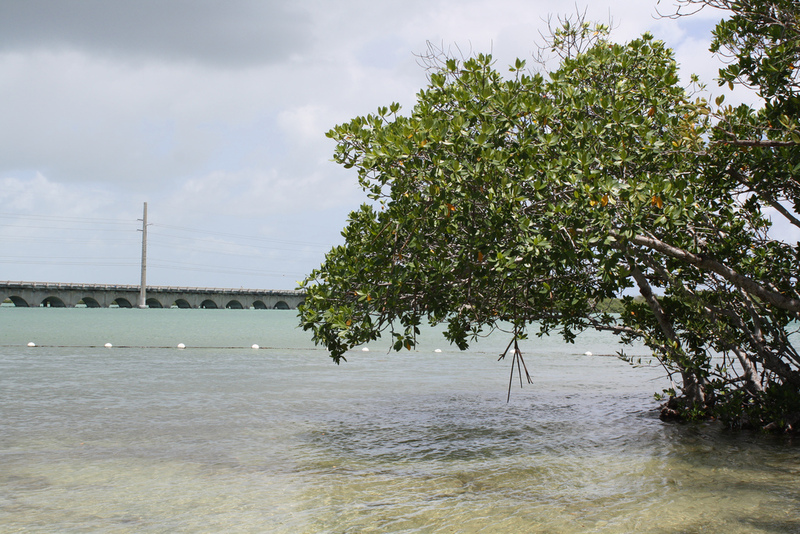 The campsites main offshore attraction is the beautiful US-1 bridge spanning the Atlantic Ocean (seen here) & Gulf Of Mexico on the other side of the roman arched pillars. It’s absolutely FREE to drive into the KOA park and walk around, there’s a small store, restaurant, & bait shop that would be more than happy to sell you a hot meal, cold coke or chum. Don’t be shy to stop by and check out the views… I did and LOVED every minute of it! You can find this fantastic campground along with the infamous Liars’ Bench photo-op just off of US-1 South at Mile Marker 20.0 ocenside. Turn onto Road 939B and head into the southernmost KOA Kampground finding the general store & dock in the back left corner. 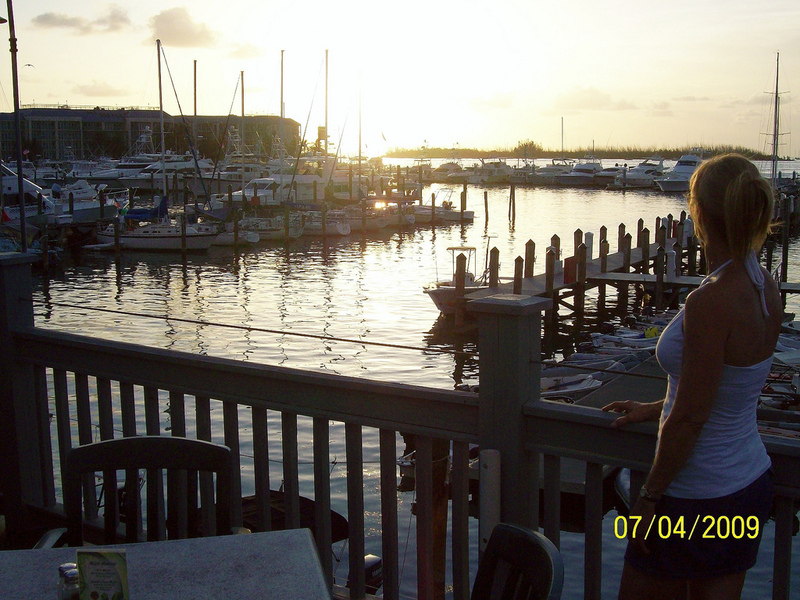 Turtle Kraals Restaurant is one of my families all time favorite places to go and eat in Key West when wanting seafood and a view. 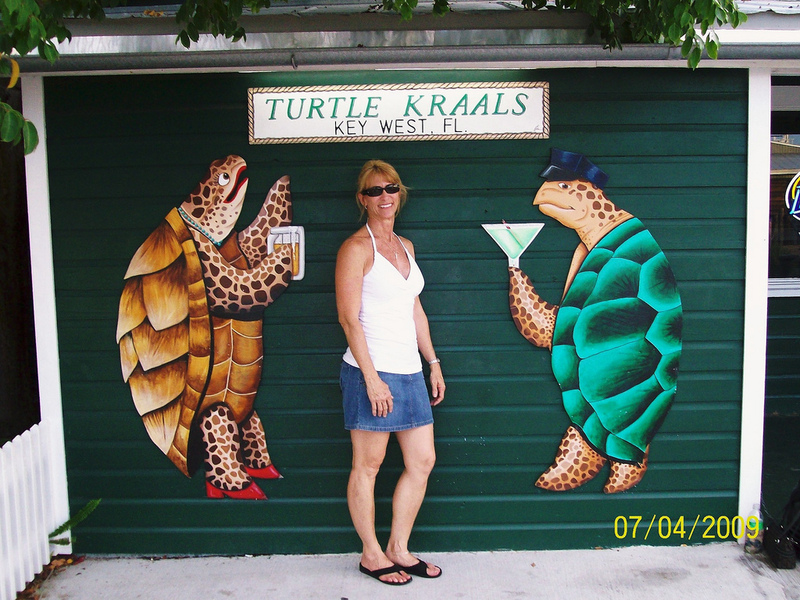 Turtle Kraals, meaning Turtle Pens in Dutch which is a throw back to when Key West was the nations #1 turtle meat supplier having its own pens to keep the turtle right here at the restaurants exterior. Turtle Kraals offers inside dining, outside dining and my favorite upstairs outdoor dining with a view called the Tower Bar. The signs here are well worth a stop for the souvenir photo even if you don’t stop and eat. The large photo above is located outside the front door to the left and gets most of the tourists attention. The next and almost better sign (pictured below) is a lot harder to find being inside at the top of the stairs to their outside dining area saying “It’s More Fun On Top”! 🙂 Although the sunset seen from here is not the best it’s still memorable if in this area when the sun is setting. You can find this dining pleasure in the area of town known as Historic Harbor Walk. Enjoy your seafood, a view & your souvenir photo here on your next trip to paradise. I ask you, does this look serene, relaxing and enticing? Believe me it is! I found a LONE picnic table open to the public with a view like no other sitting only feet away from the ocean’s edge. I’ve blogged on parks and beaches with picnic tables that sit further back, this is by far the closest. 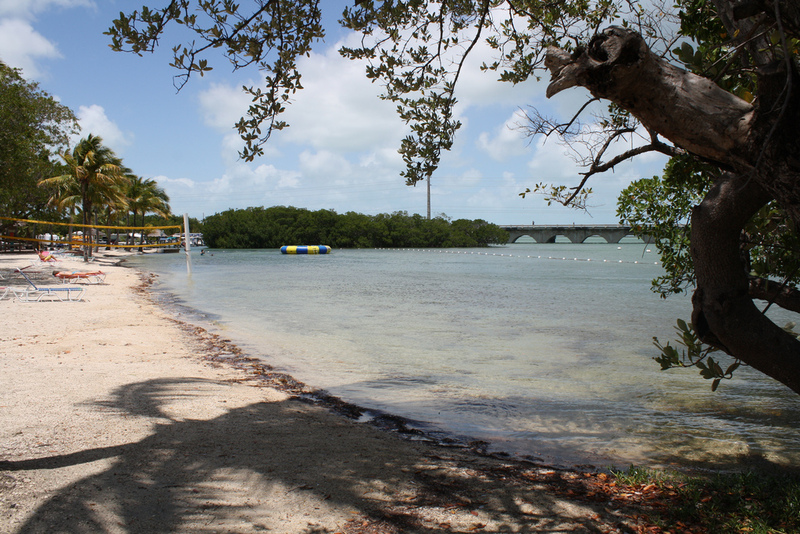 Here’s your chance to enjoy Key West’s island atmosphere, oceanic serenity and yes plenty of Florida sunshine since there’s no pavilion or shelter here. With a view like this, who needs a shelter to enjoy a picnic lunch! 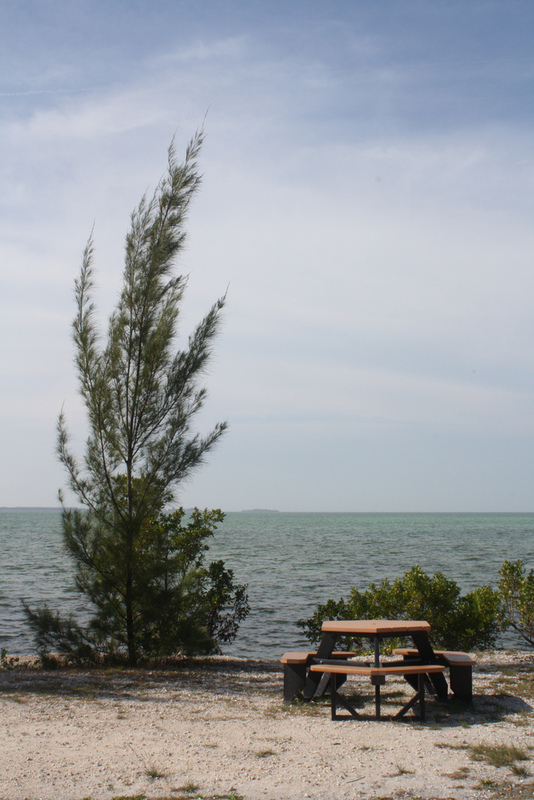 You can find this on the campus of the Florida Keys Community College just outside of Key West at one of its two entrances at Mile Marker 5.0 & 4.3 onto the horseshoe-shaped College Road. Drive down the road about 1/2 mile from either entrance behind the Tennessee Williams Theatre. Keep driving to the furthest back left hand corner past the pool and between the two building where the road ends and memories begin.